Anticipation was high for Day 1d of the 2011 World Series of Poker Main Event on Sunday as everyone waited to see what the final numbers would be. Phil Hellmuth was awarded for his contributions to Bad Beat on Cancer during the 2011 WSOP to kick off the festivities. Hellmuth was then joined by Holly Madison and the two announced the ceremonial "Shuffle up and deal!" It became apparent before the day even started that it would be the largest of the four Day 1 starts. Over 2,200 players had registered before the doors were opened and many more made their way through the registration lines before the totals were announced. Some of the players that took their seat on Day 1d included Tom Dwan, Prahlad Friedman, Frank Kassela, Melanie Weisner, Bertrand Grospellier, Steve Zolotow, Chino Rheem, Jennifer Tilly, David Williams, Liv Boeree, Jennifer Harman, Barry Greenstein, Eric Mizrachi, Robert Williamson III, Mike Sexton, Matt Jarvis, and Vanessa Rousso. Former Main Event Champions Joe Hachem, Huck Seed, and Jamie Gold were also in attendance. After about three levels, the final numbers for the day and the Series were in. A total of 2,802 players turned out for Day 1d, setting the total runners for the 2011 WSOP Main Event at 6,865. The Main Event will provide a payday for 693 players, and the winner will receive $8,711,956. These numbers make the 2011 Main Event the third-largest in WSOP history. Also, it was announced that 75,672 players turned out over the 58 events of the 2011 WSOP, a 3.7 percent increase over last year's all-time record field. The rumors of the death of live poker have been greatly exaggerated. Four members of the 2010 November Nine were in action on Sunday, but only one advanced to Day 2. Jason Senti quickly fell to a short stack and was not able to work it to Day 2. John Dolan had a similar fate. He was knocked down to 6,525 late in the day and failed to rebound. Matt Jarvis was just above his starting stack in chips to enter the last level of play, but when the chips were bagged and tagged, he was nowhere to be found. Joseph Cheong was the only 2010 November Niner to advance after having a solid day. He finished the day with 54,150. A portion of those chips came in one hand after a strong river bet. On a flop of , Cheong check-called a bet of 1,500 from his opponent. When the fell on the turn, Cheong check-called another bet, this time for 4,000. The river then brought the and with multiple draws now possible on the board, Cheong pushed out 37,000 chips. His opponent had about 11,000 left and thought a few seconds before finally letting go. At the end of five levels, Maynard Little finished as the chip leader with 179,450. Right behind him is Benjamin Mintz with 176,975. Anthony Lellouche finished fifth in the Day 1d field with 155,200. Other big names finishing flush with chips include Doug Lee with 133,950, Lyle Berman with 127,575, Freddy Deeb with 109,525, Kevin MacPhee with 106,850, and Benjamin Volpe with 101,725. All three of our former Main Event champions advanced to Day 2 play. Jamie Gold came close to tripling his stack and finished with 82,000. Joe Hachem finished up with 45,725 and Huck Seed finished with 42,600. When the final hand was dealt on Day 1d, 1,874 players remained. They will join the 616 players that advanced through 1b on Friday to make a field of 2,490 players for Day 2b. Those players will return on Tuesday looking to build chips for a run at the money bubble. 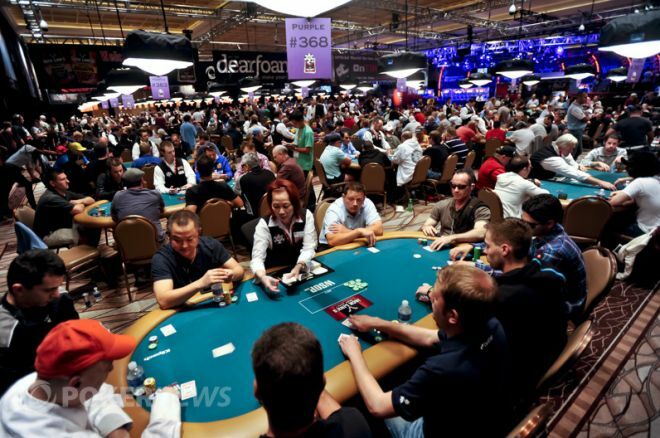 For all the action from Day 1d of the 2011 WSOP Main Event, check out our live reporting blog. The fields from Day 1a and Day 1c will combine and return on Monday for Day 2a. Fred Berger will lead a field of 2,181 players as they complete five levels of play and start their march toward the largest money bubble in poker. If you missed any of the PokerNews Podcast this past week, you missed a ton. In addition to recapping the $50,000 Poker Player's Championship and the last of the preliminary events, you also missed the buildup to the Main Event and coverage from the first two opening days. You also missed out on guests like Faraz Jaka, Jack Effel, and Matt Glantz. The good news is that you can check out our archives for any episodes you missed. Access our archives for the prior week by clicking here. Phil Galfond and his father, Glenn Galfond, both played in Day 1d on Sunday. Kristy Arnett caught up with both of them to talk about how things were going so far, and to try and get some dirt from Glenn about Phil. PokerNews is your source for all things Main Event. Follow us on Facebook and Twitter.